Hello all! I wrote this post a while ago, but I feel it’s more relevant now than ever 🙂 I am a bit more active on my Whaleshares account, I don’t have any free time to post quality posts right now or the near future. Would you guys rather I post tiny posts or reposts instead of not posting at all? I’m considering taking a break for a couple of months, but I’m afraid if I don’t post anything, I’ll have a very hard time getting back into posting here. Right now I hope to motivate semi active and inactive Steemians to use their votes more effectively, even if they have little SP. I have been less active, but my votes aren’t wasted. Minnows and planktons can make a difference in greater numbers. Moreover early votes add to a post’s visibility, so basically a small vote is worth more if you vote sooner. Autovotes generally vote 20 min after a post is created. Many good posts are lost to never be seen after only 2 hours, not to mention a few days. If you’re too busy to make a list of people you want to upvote, you can still contribute by joining one of the several dedicated curation trails. This also applies to those worried that autovotes spoil Steemians making them work less hard, which I personally disagree with. Being valued is a great motivator and energy booster, while being constantly undervalued can make Steemians lose hope and quit. Lastly, don’t expect to get bigger reward for autovoting, that only works for significant amount of SP. So stick to voting content you enjoy, not because a poster has big payouts. Next you need to decide who to upvote. Curation trails are a great way to get started. 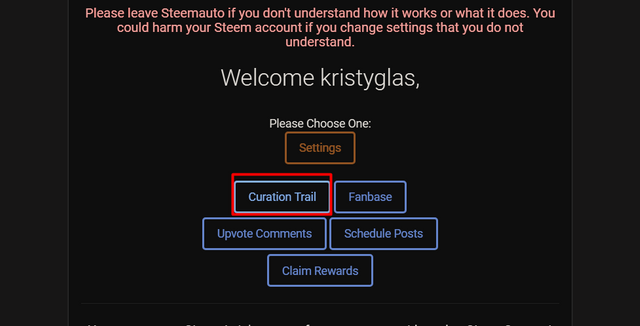 This means you’ll upvote the same posts as the Steemit account you set it to. If you want to autovote specific Steemians then go to Fanbase. There write the usernames and set the vote %. The default is 100%. If someone posts daily, your votes may get drained fast so you may want to lower % or manually vote them. Watch out, if you set the % too low, you might vote 0,00 which doesn’t benefit anyone. Lastly it’s good to set a daily limit to 1 per Steemiam, as some post same post in different languages. Do you approve or disapprove of autovotes and why? Next Post Deponia the Complete Jorney! Free for 1 Day! !